And the price is DEATH. Not really, it's $14.99. The much-loved Diablo 2 class, the Necromancer, is coming to Diablo 3 next Tuesday, available digitally via the Blizzard Shop on June 27 for $14.99 / £12.99. The returning class has been developed to celebrate the 20th anniversary of the Diablo series. It was originally due later in the year, but Necromancers are very good at coming back from the dead. The Necromancer is a fully featured class with his/her own collection of skills, runes and passive abilities. Classic abilities like the bone spear and corpse explosion make a triumphant return, and the Necro will also be able to curse enemies and summon companions from the underworld to mob enemies. The art team has clearly had fun reproducing the gothic vibe of Diablo 2's most iconic character. The pack adds legendary gear sets that let you spec towards the Necromancer's specialties. 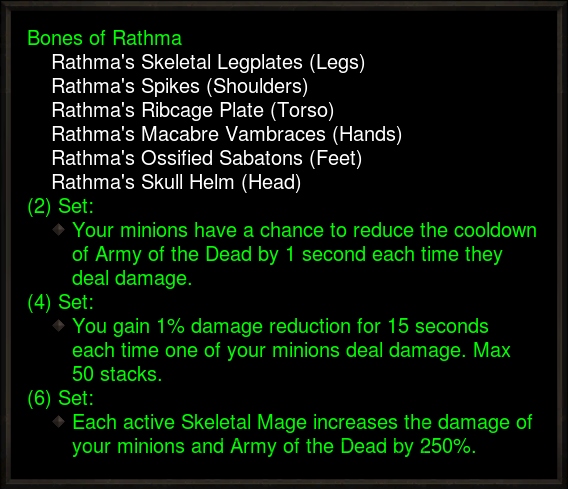 The Bones of Rathma make your minions awesome. 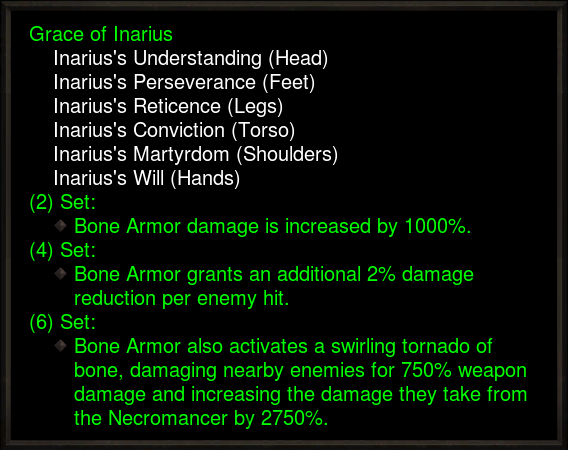 The Grace of Inarius set makes Bone Armour awesome. Grab all six components and Bone Armour "activates a swirling tornado of bone, damaging nearby enemies". You'll notice a heavy bone theme here, which is continued in the items' visual design. More of the pack's sets and legendary items are listed on the Diablo 3 blog. The Necromancer has been fine tuned through a long period of beta testing that exposed and fixed some of the Necro's more ludicrous item/ability combinations. You can find out more about him in Blizzard's Q&A. The Necromancer pack also includes a "twisted and misshapen Half-formed Golem" pet, a 'Wings of the Crypt Guardian' item, two extra character slots, two stash tabs (woo!) and a Necromancer portrait, banner, sigil, accent, and Blood Master pennant. A free update is due alongside the expansion that will add Challenge Rifts. The system picks up a rift dungeon that one of Diablo 3's players has already run, and then gives everyone the chance to take their shot. The especially neat part is that you must play as that player's character, with their build and loadout. There will be leaderboards each week that lets you compete with your friends. This is the first time Blizzard has added a new class as its own expansion for Diablo 3. It's a neat way to refresh the entire game, and while Blizzard says that the Necromancer was created purely as a cool way to celebrate Diablo's anniversary, I wonder if it will open the way for more class expansions in future. In the meantime I've chatted to the Necromancer's designers to discuss how Blizzard has had to tweak the Necromancer to fit Diablo 3. You can read all about that on PCGamer.com in the coming days.